Liza Gardner Walsh taps that youthful optimism/lust for riches in her Treasure Hunter's Handbook. . . .[It is] a cheekily useful children's primer to seeking fortunes mythological, geological, and man-made. Really, this is an activity guide for parents and caretakers. With equipment lists, step-by-step directions, and bright color photos, Gardner Walsh guides families through the basics of gold panning, geoaching, seeking pirate treasure, setting up a killer savenger hunt, and more. 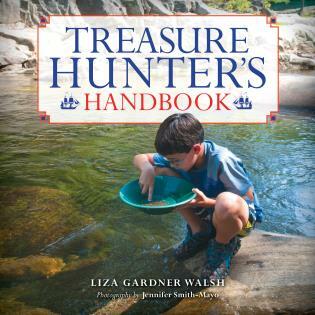 Treasure Hunter's Handbook by Liza Gardner Walsh, will be a welcome addition to the bookshelf of those children who busrt with energy, curiosity and a love of the outdoors.